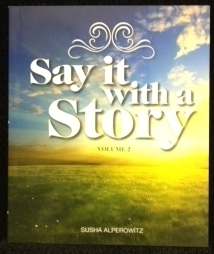 Say It With A Story II puts the powerful impact of the story at your fingertips. This volume contains a new compilation of inspiring and heart-warming stories and anecdotes brought together in a dynamic format by well know educator and speaker, Susha Alperowitz. Share them with your audiences, for nothing touches the soul as a story well told. Paperback. 104 pages.